February 12, 2019 – ASTON, Pa. New Way® Air Bearing’s Annual Fun Day event is an opportunity to build camaraderie both within the company and with the local community. An important part of New Way’s mission, as a Philadelphia-based company, is to be a part of and give back to the local community. For this year’s Fun Day, New Way closed shop and went outside for some fresh air. 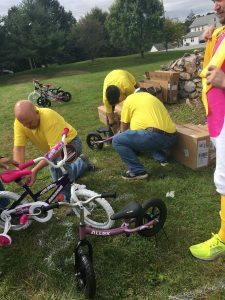 While taking a well-deserved break from creating frictionless motion with our Porous Media TechnologyTM, employees used their engineering and problem-solving skills for a different challenge: building bikes for local charities! One of the team building exercises involved splitting up into groups and putting together four kid’s bicycles. Each team was given a box with all the parts inside. Groups were timed to see who could build their bikes the fastest. But teams weren’t just rated on speed, they also had to produce a quality product, i.e. the bikes had to work. After each team finished, the bikes were tested for rideability. New Way employees built 24 bikes that were donated to local businesses that ran toy drives in December during the holiday season. Deja Vu Salon in Media, PA organized a toy drive that benefitted City Team Chester, which provides support for individuals and families in Chester, PA who are struggling with poverty, homelessness, and addiction. The 8th Annual Chester County Toy Run, organized by Wide World Chester in West Chester, PA, received 8 bicycles, which went to the Chester County Youth & Family Services. The owner of sakkstyles.com, Kenyah Harbin, held a giveaway for local children. Children were nominated and their names were drawn from a hat to receive one of the bicycles. The annual Fun Day is yet another way New Way works to build supportive and collaborative relationships– from within the organization and out into the local community. “Part of our mission as a company is to be a community partner, and this is one small way that we are able to give back a little,” says Hackett. Combined with the annual Manufacturing Alliance of Chester and Delaware Counties networking event and their participation in the What’s So Cool About Manufacturing? contest, New Way really puts being Philadelphia-based and community focused front and center.